Catherine Marsh. A Sketch of the Life of Capt. 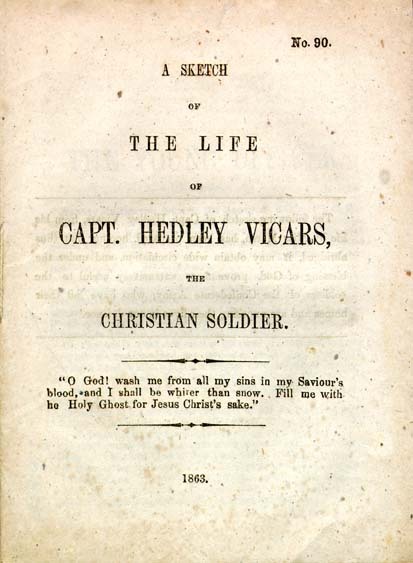 Hedley Vicars, the Christian Soldier. he Holy Ghost for Jesus Christ's sake." The following sketch of Capt. Hedley Vicars, from his life by Miss Marsh, has been prepared, hoping that thus abridged, it may obtain wide circulation, and under the blessing of God, prove more extensively useful to the soldiers of the Confederate Army, who have left their homes and are exposing their lives in our defence. HEDLEY VICARS was born in the Mauritius on the 7th of December, 1826. His father was an officer in the Royal Engineers. When the boy was 12 years old, that father's dying hand was placed upon his head, with the prayer that he might be a good soldier of Jesus Christ, and so "fight manfully under His banner" as to glorify His holy name. From this time Hedley's love for his mother deepened into that peculiar form of protecting tenderness which seems the prerogative of the widow's son. This, together with much gentleness, and a sensitive regard for the feelings of others, combined with singular strength and steadfastness of purpose; contributed to form his noble and beautiful character. On Christmas, 1843, his mother received a letter announcing that her son had obtained a commission in the line, written by the same hand which, on Good Friday, 1855, informed her how faithfully unto death that commission had been fulfilled. He was an ardent lover of his profession, and, from first to last, devoted to its duties. In writing to his mother an account of his first review, with its fatigues of marching, skirmishing, and firing, he adds with boyish pride; "But my zeal for the service kept me up." In the autumn of 1844, he returned home to take leave of his family at Ladgford Grove, in Essex, before sailing for Corfu. His elder sister well remembers his joyous bearing as he first exhibited himself in the Queen's uniform, and her own admiration of the bright, intelligent countenance, broad shoulders, and well knit, athletic figure of her young soldier brother. A few weeks afterwards, he sailed for Corfu--now fairly launched in the world in a profession beset with temptations. He still retained the frank demeanor and generous disposition which distinguished him as a boy; but at this period of his life his reckless disposition led him into scenes of which his conscience disapproved, and into excesses which, though never matured into habits, and by the grace of God, early and forever abandoned, were ever afterwards the subject of bitter and sorrowful repentance. "I see it all now, my darling mother. Ever since the receipt of your last letter I have been in a dreadful state of mind. I feel that I deserve God's punishment for my undutiful conduct towards the fondest of mothers; but the thought had never before occurred to me that He might see fit to remove her from me. What agony I have endured, what sleepless nights I have passed since the perusal of that letter. The review of my past life, especially the retrospect of the last two years, has at last quite startled and at the same time disgusted me. You will now see the surest signs of repentance in my future conduct, and believe me, as far as in me lies, never shall another moment's anxiety be caused you by your dutiful and now repentant son." "My darling mother, I do love you, and that fondly, although I have often (may God Almighty forgive me!) rebelled against your wishes. Mother, I ask your forgiveness for what is past; you know not what real anguish some of your letters have caused me, and although I have tried to drown the voice of conscience after reading them, a still, small voice has always been whispering in my ear, and kept me from many a sin." In writing to his sister at the same time, he alludes to his forebodings of an early death, and wishes he were "prepared:"
"I am no coward, but the thought of death is solemn, and the idea of dying far away, with no mother or sister to give me comfort in my last moments, is sad enough; yet I hope the effect of these reflections is wholesome, and will make me consider seriously whether I am fit to die." "I must tell you of the death of a brother officer, Lieut. Binden. He died on the 12th of May. Poor fellow, his was a short but painful illness. When I went into his room, the sun was shining brightly through the windows, the birds were singing cheerily, and the merry laugh of the light-hearted soldiers (plainly audible from their barracks) grated harshly on my ear. He was dead! Looking on his calm and placid face, I could hardly believe that I was not gazing on the living man. But alas! his soul had fled! With God's help I trust I have learned a lesson and a warning from his sudden death. He was buried the same evening in the small grave-yard near the cantonment, and, I as senior subaltern, had command of the firing party. When we arrived the twilight was fast verging into darkness, and the funeral service was read by the light of a candle. This is soon over, and then all retire from the grave except myself and armed party of 40 men. We then give volleys--the rolling echoes are still reverberating, when the earth is thrown in; and all is over. Such has been the melancholy end of my poor friend and messmate. I was deeply affected, and could not retrain my tears. I felt my voice choked as I gave the command, "Fire three volleys into the air." "I have got command of a nice company. The men are mostly well behaved. My endeavor has always been to be kind as well as strict, and I believe my men would anything for me. From the first day I saw Vicars at Zantee in 1846, 1 was struck with his manly air, and the peculiar open truthfulness of his eye. He was at this time quite taken up by the gaieties of the island. We quitted for Malta, whence in 1848, we sailed for Jamaica. During the voyage, he used to dress as a sailor, and delighted in making himself useful to the crew. In Jamaica he had the advantage of attending an excellent ministry, which had some effect upon him, but again he was led away by the influence of evil companions. At this time, as I afterwards heard from his own lips, he totally neglected prayer and the reading of the Bible, and consequently lost the power of resisting temptation. The 97th left Jamaica for Halifax N. S. in June 1851, and here we commence the career of Hedley Vicars, as a Christian soldier. It was in the month of Nov., 1851, that while waiting the return of a brother officer in his room, he idly turned over the leaves of a Bible which lay on the table. The words caught his eye "The blood of Jesus Christ, His son cleanseth us from all sin." Closing the book he said, "if this be true for me henceforth I will live by the grace of God, as a man should live, who has been washed in the blood of Jesus Christ." That night he scarcely slept, pondering in his heart whether it were presumptuous or not to claim an interest in these words. During those wakeful hours he was watched, we cannot doubt, with deep and loving interest by the one, who never slumbereth nor sleepeth, and it was said of him in Heaven, "behold he, prayeth." In answer to these prayers, he was enabled to believe, as he arose in the morning, that the message of peace was true for him--"a faithful saying and worthy of all acceptation." The past, he said, then, is blotted out, what I have to do is to go forward; I cannot return to the sins from which my Saviour has cleansed me with his blood. On the morning which succeeded that memorable day, he bought a large Bible, and placed it open on the table in his sitting room, determined that an open Bible for the future should be his colours. "It was to speak for me," he said, "before I was strong enough to speak for myself." His friends came as usual to his rooms, and did not altogether like his new colors. One remarked that he had turned Methodist, and with a shrug retreated. Another ventured to warn him not to become a hypocrite. "Bad as you were, I never thought you would come to this, old fellow!" So for the most part his quarters were deserted by his late companions.-- During six or seven months he met no slight opposition at the mess, and had hard work as he said to stand his ground. But the promise did not fail. "The righteous shall hold on his way; and he that hath clean hands, shall wax stronger and stronger. "As he felt he had been much forgiven," writes a friends, "So in proportion was his ever burning and increasing love to Him whom he had so long grieved by his sins. The name of Christ was ever on his lips and in his breast. Much grace was given him to confess Jesus before others, and when Adjutant, his example and rebukes to men for swearing carried great weight, and showed his zeal for the honor of God. The Adjutancy of his Regiment was offered to him by his Colonel in 1852, with these flattering words: 'Vicars, you are the man I can best trust with responsibility.' "
July 3, 1862. Rode out to visit Brunt, a poor ordnance laborer: read and prayed with him for nearly an hour; he appears to be very ill, but all his hopes are fixed in Christ. 5th. Rose at half past five; read a chapter in Bogatzky; I feel I am but little advanced as yet; evil thoughts during the day; read with Corporal Cranny for an hour; would that I were more like him; from not having prayed for God's blessing on what I was going to read, I felt little comfort from it; did not offer to pray with him, as I was afraid I would break down; read and prayed with Brunt. 9th. Awoke sleepy and dull, but felt much happier after prayers; lost my temper once or twice with the men; I feel that I am unable of myself to do anything aright; read Luke 15, with Cranny and prayed; in the evening I became unhappy from the thoughts of all my former sins. prayed with poor Brunt; four of the 97th soldiers came and sat down; I have great hopes of all; was enabled to speak to them pretty freely. 26th. I begin to see more clearly every day the depravity of my own heart; I spoke illnaturedly of one or two; I would that I could do two things; never speak about myself, and never speak evil of any one. 37th. Have had happy thoughts of Christ to-day; Oh! what cause have I to love him. March 23. Lord Jesus I would give myself up to thee to be led by thee in all things; give me greater energy and zeal in the performance of my duties; enable me to please my Colonel and yet to please Thee. The 97th landed in England in May, 1853, and the family of Hedley Vicars were again made happy by his presence. Blessed, and a blessing wherever he went, it would be beyond the limit of these few extracts to tell of all his labors in his Master's cause, and of the influence for good which he exerted in whatever company he was thrown. I was struck with proof that God is no respecter of persons, and has his own people in every class. I saw two wretched look- looking men picking up pieces of rag, as I thought, in front of the guard tent. After they had collected several, they sat down. I went to them, and found they were collecting pieces of meat and biscuit that had been thrown away by the men after dinner. These they ate ravenously. I got them some clean meat, and conversed with them about ten minutes, They seemed surprised that an officer "in such fine clothes," talked to them about Christ. One of them had been a stoker in a railway, who had been run over by a train which had smashed his hand and foot, yet he could talk with delight of the mercy of God his Saviour, and of His goodness and forbearance! Who knows but that I may meet and recognize these poor fellows in Heaven." "I was dining with a nice family near Canterbury, and met a large party. I noticed opposite to me a very pleasant looking fellow, and was struck by his quiet, calm manner and countenance. After he had adjourned to the drawing-room, I asked him if he belonged to the Army Prayer Union? To which he said 'yes.' We became friends at once. He said, 'there is a man in the 97th whom I want to know; his name is Vicars.' I replied, 'there is a man in the Rifle Brigade whom I want to know; it is Captain Hammond.' * We were at each other's service. On Saturday he came to see me, and staid for some time. He is a delightful fellow. I sent for Cay, and we had a happy time of communion together. It is a great blessing to have such a brother officer as Cay. He is one in a thousand. We often walk together, and he generally comes up to my barracks after mess, and we read the Bible, converse about heavenly things, and end in prayer." "Dearest Mother--Here I am thank God; safe and sound; but, alas! in quarantine for seven days. We had a prosperous voyage and delightful weather. I was in hopes that I should have had a cabin to myself, but was doubled in with two cadets in the East India service. At first I was strongly inclined to avoid the reproach of the Cross, and not to make a mark of myself by kneeling or reading the Bible in their presence before retiring to rest; but God gave me grace to overcome this. Still it shows me what a coward I am, that I should even for an instant be tempted to hide my colours and be ashamed to confess Christ!" * CAPT. MAXIMILIAN HAMMOND, RIFLE BRIGADE.--This brave and Christian young officer fell in the Redan, while "making a pathway for his men, in the final assault upon Sebastopol, September 8th, 1855," honored and beloved by all who knew him. Faithful unto death in the service of the King of kings, as in his duty to his Queen and country, he has received, we doubt not, "a crown of glory, which fadeth not away." Scarcely had Hedley Vicars sailed for Gibraltar, when the startling order for an army to proceed from England to the East, shook the heart of peaceful England to the centre. Parting words were spoken and farewell blessings given to extend over fields of bloodshed and death. At length came the notice of the 97th's being under orders. Hedley hurried home to say farewell to all most dear to him. At Beckenham, among beloved friends, there we find him, on the evening of his arrival, addressing a number of the navvies at the reading-room of the village. It was crowded, and many more surrounded the doors. He spoke to them--"Prepare to meet thy God"--and no man, on his dying bed, could have spoken with with greater solemnity and earnestness. There he stood, a strong young man amidst strong young men, "putting himself alongside of us as a fellow-sinner," as one of them said, "yet so good now, and such a man withal!" As they crowded round to say farewell, and wish him safety and success, they were heard saying among themselves, "It is a pity such a fine fellow as that should go to be shot!" On his way to the station he visited a dying man at Sydenham, with whom he prayed. The man said, "he never heard such a prayer: it went straight to his heart!" While waiting for the train, he spoke to a dear friend of the comfort of love between Christian friends, and then added, in a low under-tone, yet slightly hurried, "I have one last favor to ask of you: when I am shot, write to my mother; see her when you can, comfort her as God will teach you." Very early in the morning of the day he left for London, he and big mother met for prayer. He knelt long by her side, pouring out his heart in pleadings with God for her, that grace and strength might be given for every hour of need. Strengthened in spirit by that prayer, she was able, with his sisters, to go with him to the station. The remembrance of his last look, his last embrace, his last blessing, still dwells in their hearts, and makes that, parting-place seem almost like holy ground. hundred men in the regiment." "Four hundred!" was repeated with surprise. "I don't mean that he has made all the four hundred as good as himself: that he couldn't. I know enough about religion to know that God alone could do this. But while he was Adjutant, and since too, he has sobered and steadied nigh four hundred of the drunkenmost and wildest men in the regiment. There is not a better officer nor a better man in the Queen's service." It was lovely morning, the 19th of May, when the dear friend whom he here mentioned drove to the Waterloo station to say the last farewell to Hedley Vicars. The sunshine glittering on the bayonets of the men as they marched up the steps to the station seemed to mock the tears of wives, sisters and friends, who accompanied them. A young wife was seen to quit her hold of her husband s hand, and approaching Hedley Vicars with a manner of respectful confidence, said: "Oh, Mr. Vicars, you will see that Cottrell writes to me regular, won't you? It is my only comfort to know that you will." The kindness and sympathy of his tone as he answered, told that her confidence was not misplaced. During the delay of the train those dear friends read together in the waiting-room the 121st Psalm, parting with the words, "The Lord is thy keeper." "Jesus is very precious to my soul; my all in all. Often have I been on the point of falling away, and yet His arm has held me up, and kept me from bringing dishonor on His blessed name. To Him be all the praise and all the glory." It was the love of Christ constraining him, find no mere sense of duty which led Hedley Vicars to spend the greater part of his days, and often of his nights, in the pestilential air of the crowded hospitals. Dearer than life to him was the hope of persuading the dying to look to Jesus, and precious indeed was the privilege when the lighting up of a dying eye at the sound of that beloved name, assured him that he was ministering to one of the Saviour's flock--"I was sick and ye visited me." "I have been thinking over the time we spent at the Piroeus, and will tell you of anything that strikes me I was constantly with Vicars there, and know better than any one else what his daily life was. He never for a moment seemed to forget whose he was. When he was in the camp on first landing he was in the habit of going out for hours alone amongst the rocks on the seashore, having only his Bible, which I remember he told me Dr. Marsh called 'his sword.'" There was no Chaplain for the English Regiment there. Part of the services was generally read by the officers to the men of their own companies; and the officers in rotation took the duty morning and evening of burying the dead, which sometimes, of our English Regiment only, after the cholera came, exceeded ten daily. Vicars undertook this duty several times for others, and seldom, if ever, performed it without addressing a few earnest words to the men present. Soon after the sickness broke out he used regularly to visit the hospitals, reading and praying with the dying men, and seizing every opportunity to speak to others of the "one thing needful." "Should I die now you know my only ground of hope, my only confidence, my only assurance is in the cross of Jesus Christ and in the knowledge that the precious blood of Christ cleanseth from all sin--words as full of sweetness to me now as on the day that they were first made to my soul the power of God unto salvation." PIROEUS, July 25th.--"Death for hours has been busy among our poor fellows since I wrote. Twenty-seven have fallen in seven days. Do you remember Reynolds whom you noticed when you gave the hymn-book at Kensington barracks? I buried him and another comrade last night. I had intended speaking a few words to the men over the open grave of their dead comrades, but it was as much as I could do to get through the service, and as soon as I began to speak to them afterwards, I could not for the life of me help crying like a child. The men cried and sobbed round me. It was no use to try to get on, so I ordered them to 'fall in,' and we went mournfully back to the barracks. Morning and evening the dead cart leaves the hospital for the grave-yard. It is sad and solemn, but I trust that many have learned a lesson that will never be forgotten." Aug. 18.--"About seventy of my hundred and seven comrades who have died of cholera, were men whom I well knew. I do hope that some, nay, that many amongst them were enabled to look to Jesus in their last moments. God grant that we may find such to have been the case when we all meet at the last day. who had been admitted about an hour before. His eyes were sunken, and his hollow cheeks and his blackened face showed that the fearful disease had seized upon him with the grasp of death. I spoke to him for a little while and then passed on to others. The next day his bed was empty. One of the orderlies told me that he suffered much in his mind before he died. He had his senses to the last which is very unusual. He asked one of the men for a pray-book; not one was at hand. He then said 'read me the first chapter of the Gospel of St. John.' At its close he said, 'I feel much revived in my mind'--and died. Oh, we will believe I that he was enabled to 'behold the Lamb of God which taketh away the sins of the world.' I cannot tell you how sorry I was that I was not there." Aug. 21. PIROEUS.--"You will be glad to hear that there is a decrease of cholera. The last man we have lost, one of the Light Company, was admitted in hospital last night. Poor fellow, he suffered most dreadfully; it was painful to stand by his bedside. I remained with him for nearly an hour and spoke to him from time to time of Jesus, but whenever the cramps came on, his screams quite drowned my voice. On leaving I shook hands with him, his were black and cold, and told him to 'behold the Lamb of God which taketh away the sin of the world, to look to Jesus 'whose blood cleanseth from all sin.' When, I mentioned the name of Jesus, he gave me such a wonderful look, full of peace and resignation. In less than four hours afterwards his soul had fled." PIROEUS, Nov. 2nd. The order has at length arrived for the 97th Regiment to hold itself in readiness for immediate embarkation join Lord Raglan's army. There can not be a doubt that this is a just war which we are engaged in, and therefere, I say the sooner we are 'let loose' the better. I think the Hessians will find the Celestials rather awkward customers to deal with, 'Nous verons.' There are some people, I know, who can not imagine how any christian could ever join in the deadly strife of battle, but I can only say that with such I do not agree; so that I shall not shrink from my duty to my Queen and my country, the Lord being my helper. I consider war to be a cruel calamity, but as much a visitation from Heaven as cholera, and, as on the appearance of that dreadful malady, we do not sit quietly down and let it take its course, but, trusting to the blessing of God, use every precaution and employ every means to drive it from amongst us, so in the case of this war with the Russian despot. He has made aggression upon a country which had given him no just cause, and thus disturbed the peace of Europe, and let loose upon us the horrors of war, and shall we Brittons let him have his own way and tamely look on? God forbid! Rather will we, the Lord being our 'shield and buckler,' crush the evil and restore peace and quietness to out land. men, worn down by hunger, bore terrible witness to the quenchless nature of British courage. The men who stormed the heights of Alma, who in the dreadful fight of Inkerman, conquered again amidst fogs and darkness--who at Balaklava, "charged a whole army while all the world wondered," such men nave proved their steel. Yet these very men have been seen to weep, as, night after night, succeeding days of starvation and toil, they were ordered to their work in the freezing trenches. Who can estimate what they must first have endured. It was amidst scenes like these that the faith of Hedley Vicars was to have its last trial. Sharing as he did the general toil and privation, he was ever fulfilling the Apostle's injunction," Bear ye one another's burdens." During the severe cold of that winter, the only bed he allowed himself was made of stones and leaves, till the arrival of a fur rug from England, sent by a friend who was dear to him. Everything else which could bear the name of luxuries, even of common comfort, was given to the deeper necessities of the suffering soldiers. Camp before Sebastopol,Nov. 29, 1854.
duty as British soldiers, and ended in saying, 'Lads, while I have life, I will stand by the colours, and I know you will not desert me.' The poor fellows cheered me long and loud. About ten o'clock, I read by the light of the first bivouac fire, Ps. 23d, 90th and 91st, with Capt Ingram and derived great comfort and peace from them. Resting on Jesus my precious Saviour, I went to sleep securely. My bed was made of dry leaves with a stone for my pillow, and but for the biting cold, I should have slept like a top. On the morning of the 22nd, we received orders to march for the lines before Sebastopol, and came in sight of the white lines of the English and French, after a rough march of seven miles. On the morning of the 25th, I walked up the hill in our front, and had a fine view of the magnificent fortress and harbor of Sebastopol. I could clearly see the masts in the harbor across the water, where the Russians had sunk their men-of-war. Whilst admiring the place, a cannon ball from one of of their batteries whizzed past my ear. I have been told since, that the Russians think nothing of firing shells and round shot when they see even one of our poor fellows. The weather has been stormy and our men dying with the cholera. The duty has been severe in the trenches, distant about three miles from the camp. I was in them from five in the evening till five the next morning, and also on out-lying piquet the whole of the following night, sleeping in the open air, with a few bushes over me. I could hear the tolling of. the great bell at Sebastopol and the voices of the Russians working in their fortifications, as plainly as could be. Yesterday I got a pint of water to wash my face and hands, and sorely they needed it. We have nothing to complain of in the way of rations. I get a pound of salt pork and as much biscuit as I can eat every day. The other day my subaltern and a party of men gave chase to a young bullock, close to the Russian lines; they caught him, and we made a capital dinner of part of him this afternoon. We are anxiously waiting for Lord Raglan to storm Sebastopol; for though we may lose many in so doing, yet anything would be better than seeing our fine soldiers dying as they are daily. The accounts of the Russians killing our wounded officers and men are true, confirmed by all here. We all hope soon to have an opportunity of thrashing these savages, and we have not a doubt we shall do so when, when we come across them. In the trenches the other day, one of our men amused us much. At the first shell, which passed close to him, he dropped down on his back, screaming aloud for the doctor, for he was 'kilt entirely!' The doctor ran up to him and asked him where he had been hurt, when he exclaimed; 'Och, och! doctor, clane through the blanket!' I have the tent to myself, Brinkley being on duty in the trenches. It is curious what delightful dreams I have every time I fall asleep. Now I am at Terling, surrounded by all your beloved faces; then, again, at Beckenham, with those I love so dearly. At another time I am going to read to old Sophy; again, sitting by the fire in the drawing room, telling tales of the past to dear John, and awake to so my teeth chattering, a sharp stone sticking into my side, the wind howling in gusts and squalls, and a concert of cannon and small shot, with variations from English, French, and Russian performers, instead of a chant in the hall. The night before last, one of my beautiful dreams was dispelled by a shaking of my tent, and in answer to 'who is there?' I received the reply, 'Please, sir, a staff officer has just ridden into the camp to bid us ready at a moment's notice--the Russians are moving on our right flank!' 'All right,' said I; and, commending myself to my Heavenly Father, fell fast asleep again, knowing that I was all ready for a moment's notice. However we heard no more of it. While I write, musketry is hard at work, and cannon roaring. It is with difficulty I manage to scrape together time and material for writing. My best love to dear Edward and to dear Lord Rayleigh. May God bless him, soul and body. are resigning their commissions. I can only say, shame on those who desert their country in this time of need! We all made a great mistake in not bringing warm clothing with us here. I did buy a comforter though, which is more than most fellows have. Thank God I am very well and in fine spirits, only hoping that Lord Raglan will soon let us try our hands on the Russian. Oh, precious sister! from whom I may so soon be parted here, remember Jesus, and never be ashamed to confess Christ crucified! Jesus has bled for us, has redeemed us, has saved us! Oh, then, let us not cause his once wound heart to bleed for us again, but looking for Heaven's aid, let us seek never to grieve him more. "It is six months since I have been in reach of a house of prayer, or have had an opportunity of receiving the sacrament, yet never have I enjoyed more frequent or precious communion with my Saviour, than I have found in the trenches or in my tent. When, I should like to know, could one find a Saviour more precious, than when bullets are falling around like hail?" "December 18.--I am, thank God, quite well: never better, and what is more, clean! You know my weakness for 'cataracts.' Well, I have contrived to get one every day for nearly three weeks, but then I take more pains to get water than most fellows. We dined to-day off soaked biscuits fried in lard, a capital dish; boiled ration pork, very good; potatoes, middling, with mustard and salt--my wine being weak rum and water. I am sure drinking spirits is a bad plan, and, besides being injurious, makes a man colder an hour afterwards. Each officer and man is allowed a gill of rum daily, but I never drink even half of mine, often none at all. I went on picquet this morning at half past four, with fifty men. It rained hard for about an hour. I kept up a jolly fire, and endeavored to write a letter to darling mother, while seated opposite its blaze. I read the first Epistle of Peter, and then folding my cloak around me, and stretching myself close by the watch-fire, I was sound asleep in ten minutes, notwithstanding the roar of cannon and rattle of musketry which kept up a concert during the night." "We are expecting every day to meet the enemy in open field, or to storm the fortress. I wish they could go at it at once. Be not anxious about me. I am safe in the arms of my Saviour. I know it--I feel it--in life or death. "CAMP BEFORE SEBASTOPOL, Dec. 25.--Thank you, dearest friend, for your affecting letter from Mr. Halkett's house. I grieve much to say, that there is no hope left now that dear Halkett * might be a prisoner in Sebastopol, but I believe he is in the presence of his God, clothed in the spotless robe of his Redeemer's righteousness. The man who so loved the 14th chapter of St. John, has found it all true for him. I shall make the motto he chose for my own, and, if I am to fall too, I hope I may die with it on my lips: 'In God is my salvation and my glory; the rock of my strength and my refuge is in God.' Give my love to his dear young wife, and tell her I pray God to comfort her. Her message went to my heart. I know not that I could have 'saved him,' but I would have carried him to the rear or died in the attempt. I have prayed that Jesus himself would comfort her. I know He will. Bless you, my own mother, sister, friend and counsellor. Give my warmest love to all around you, especially your honored father. God bless him, and God bless also the father of her I love best on earth. "Christmas day, 1854. I am for out-lying picquet in ten minutes, and have but time to wish you a happy Christmas. It is so bitterly cold. I can scarcely hold my pen. I have enjoyed the day as much as could be expected, and partook of the sacrament with (thank God) thirty others. May our Father, 'the Father of all mercies, keep us ever 'looking unto Jesus'our Saviour." * Major Douglas Halkett, who fell in the flower of his age in the charge at Balaklava. His thoughtful and benevolent character had won him the name of "Father of his Regiment !" Brave as he was gentle, his gallant bearing was noticed even amidst the fury of that death-charge. The last time he was seen was in the field fearfully wounded, holding out some bank notes to his men, with the characteristic words "Take them for the wives and widows at home!" A paragraph in the public press, early in the month of January, 1855, conveyed the first intelligence that three officers had been found dead in their tents from the effects of the fumes of charcoal, and that another was hanging between life and death; that other was Hedley Vicars. He had returned to his tent chilled and weary, after a wild and snowy night in the trenches. Before throwing himself on his miserable bed of leaves and stones, he told his servant, as it was intensely cold, to make a small fire of charcoal in the dish, and to leave the door of the tent partially open, imagining that this would secure him from any injurious effects. Providentally he was for out-lying picquet that afternoon. His servant, who had several times called him, I at last became alarmed, and went for the surgeon. He found him returning from the tent of another officer of the 97th, for whom, alas! his aid had come too late. Hedley was carried into the open air and laid on the snow. His men stood round him wringing their hands. Some assisted the medical officer in chafing with snow the body of him they loved, in hopes of restoring vitality. At length, after the severe methods of blistering and bleeding had been resorted to, consciousness returned. He was spared for a nobler end, to fulfil his own choice--"As a soldier I will die!" "January 8th, 1855. How I thank God that no one but myself slept in the tent that night, and surely I have cause to praise Him for His goodness in snatching me from the jaws of death. My first impulse, after raising my heart in gratitude to that God who had preserved me, was to see whether my little picture was safe at my heart;--it was there! I took a long, long look at the sweet face of her who had made summer of my gloomy winter, and thanked God again for having preserved my life." trenches, having just come off the sick list. Last Sunday I was unable to leave my tent, but had a happy communion with Jesus in my solitude. I find more and more every day, how little I can depend on the feelings of my heart towards Him, but my comfort is that 'Jesus Christ is the same yesterday, to-day, and forever.' During my illness I was very happy, but for some days past, my heart has seemed cold and dead. What a lonely gloomy time it is, when Jesus withdraws the light of His countenance, but at all times, I can and do trust His love and tenderness, and I feel persuaded He is sending me the trial of faith to draw me nearer to Himself." "Sunday, February 14.--After morning service, I went to read and pray with the sick in the hospital, and to distribute the blessed cards of prayer for which the poor fellows seemed most thankful. I do and will hope that many who have gone to their last homes from the dreary camp, are now before the Lamb, clothed in white robes. May not a broken heart, drawn by a Saviour's dying love, to make known its wants to Him, and to lean its hopes of pardon and eternal life on the blood of the Cross, have received the answer of peace direct from the mercy seat, (where, thank God, Jesus ever pleads,) 'Enter thou into the joy of thy lord!' "
" You ask my opinion of our prospects. I do not take the gloomy views of the newspapers--no. Although I have seen many a uoble soldier laid low forever, and regiments reduced to less than half their number by sickness, since November, I have no fears of the ultimate result by the help of God. The French have a large army, 80,000 or 90,000 strong in the Crimea, and more regiments arriving every day. And what, with these and 12,00 British, we are able to defeat any Russian army that Menschikoff can bring against us. The boxes sent, &c., have arrived, and their contents are invaluable. How kind in that lady at Torquay to cut up her fur cloak into chest preservers for the soldiers. much more comfortable for my purposes since I excavated it; there is more room, and it is warmer. I have a fire-place now; what do you think of that; which only smokes three or four times a day; a small chair I bought at Balaklava, a little table made out of the bottom of an old case, and as for my bed, with the depth of that fur; why it is the envy of all who see it. And though the others beat me in having bedsteads and double tents, I think my house now the most comfortable in the camp, and at all events it will be, when the candlestove arrives. Feb. 19.--"On my return to my tent, I found there Mr. Duncan Matheson, the soldier's missionary. We read the third chapter of Ephesians, and he prayed with me. When he left, I saw that three of my brother officers were standing close by; they must have heard that fervent prayer. Who knows but that one of them may be led to pray for himself this night. God grant it! One of these three said to me the other day, 'Vicars, I dreamed about you the other night, and I thought you were speaking to me about religion.' 'Well, and did you like it?' I said 'Yes, very much,' he replied. May the Lord give me courage to speak faithfully and earnestly, bless my feeble words to his soul's good, for Jesus' sake." CAMP BEFORE SEBASTOPOL, Feb. 23d, 1855. MY OWN MUCH LOVED SISTER: A thousand thanks for the welcome presents of warm clothing, &c., &c. Everything I have seen is just what I wanted. All my company now thanks to your kindness, are well supplied with everything requisite to keep out the cold. "I have seen my old friend Cay, of the Coldstream Guards, several times, and have enjoyed sweet Christian converse with him. I gave him several of dear L--'s cards of prayer; and when I went on Sunday to the Guard's Hospital, I observed one fastened to each bed. It made me glad to see weary and dying eyes resting on the words, "Oh, God! Wash me from all my sins in my Saviour's blood, and I shall be whiter than snow. Fill me with the Holy Ghost for Jesus Christ's sake." March 4th--Sunday.--"Had Divine service in the camp.--Service in the tent and barracks; and again in the evening--seven present. Afterwards took a short walk with Vandeleur, Craigie and Anderson, of the Engineers; read and prayed with Major Ingram and Lieut. Derman, in the latter's tent. Oh, what a happy day this has been." "Your letter of the 10th contains no small comfort for me. I bless God that my L--is with her more than mother to be comforted in these dark days. How I have blessed you in my heart for all your love to us both. "Major Ingram is one of my best friends, and a true Christian. We have often read and prayed and held communion together. Douglas Macgregor is very dear to me. He is a very young man and full of high spirits; which might now and then carry him away, were he not continually seeking to have more and more of the mind of Christ, and in these solemn seasons his thoughts turn often heavenwards. Do not cease to pray for him and for my subaltern Brinkley, that they may be good and fearless soldiers of Jesus Christ. Macgregor is the officer who asked some weeks ago to be my companion in visiting the hospitals, adding with characteristic ingenuousness, 'I have just been reading the words, 'I was sick and ye visited me not,' and I should not like my Saviour to be addressing these words to me.' Yesterday I visited the hospitals, and read the 12th of Heb., to a poor dying man who had beckoned me to do so when I was at the other end of the ward. He was low and wretched, but seemed comforted when I spoke of the 'blood that cleanseth from all sin.'" Poor follow! he was quickly called into eternity, for he never spoke, but fell instantly after being hit. I feel sure he was ready, and is now safe forever! I liked him very much, and his death has thrown a gloom over our small band. We were turned out the night before last by a heavy fire in our front; it lasted 20 minutes, when it ceased entirely; and ere long we were alarmed by another cannonade, and we once more stood to arms. It was a fine starlight night, and as I stood gazing in the direction of the fusillades, I thought I had never witnessed such an imposing spectacle. Shells, in quick succession, were shooting up into the air, with the bright glare of artillery reflecting over the brow of the hills in our front, and the lurid flashes of musketry as volley after volley chimed in, accompanied by the wild cheers of the combatants, which we could plainly hear at intervals, even amidst the deafening noise. In less than half an hour all was quiet, and we again in our tents. It was an attack made by the French on the Russian advanced work, from which they drove the enemy, and were in their turn driven out. "We are anxiously expecting the batteries to open in good earnest, but they say there is not shot or shell enough up yet. My love to your beloved father. I enclose a letter to my own L--. God bless you my most beloved mother--sister. Jesus is near and very precious to my heart and soul. May he ever be to you also. Ever your most warmly attached son and brother, HEDLEY." On the Sabbath which followed, his last on earth, Hedley seemed like Moses to have climbed the mountains where the promised land was seen, and to have caught the dawn of the eternal Sabbath so near at hand. Then came the day appointed for humiliation and fasting and prayer. He had earnestly desired its appointment. In some of his letters he expressed his belief, that till God was honored as a nation in the ascription of victory to His power, and in the acknowledgment of His chastening hand in defeat, we could scarcely expect success. He kept the day as a solemn fast before the Lord. After morning parade, Hedley Vicars walked with Maj.
"God bless those whose exertions have been the means of bringing about this day of national prayer. I look for great results from the prayers that have ascended to heaven this day, and have been presented by our great Intercessor before the throne of God. I have felt the day to be just like Sunday, and have derived much comfort from communion with my God and Saviour. We had two text services: Vandeleur came both times; spent the evening with Cay; I read Isaiah 41st, and he prayed. We walked together during the day and exchanged our thoughts about Jesus." Thus the last words he ever wrote, was the name he loved best. One other fragment was found in his desk, addressed to her whom he loved with the power of a true and manly heart, yet does it speak of joy and gladness from another source than that most tender love. "The greater part of another month is past, and here I am kept by the protecting arm of the Almighty from all heaven. I have been in many a danger by night and day since I last wrote to you my own beloved, and the Lord has delivered me from them all, and not only so, but he has likewise kept me in perfect peace, and made me glad with the light of his countenance. In Jesus I find all I want of happiness or enjoyment, and as week after week, and month after month roll by, I believe he is becoming more and more lovely in my eyes, and precious to my soul. Twenty four hours more and he has "seen the King in his beauty." The night of the 22nd of March was dark and dreary. The wind rose high and swept across the Crimea. There was for the time a stillness over the armies like the calm before a tempest. At the advanced post of the British forces, on the side nearest the French was a detachment of the 97th Regiment commanded by Capt. Vicars. No watch fire on that post of danger might cast its light as aforetimes upon the book of God, yet was that place of peril holy ground. Once more the night breeze bore away the hallowed sounds of prayer. One stern duty more, oh! soldier and Christian, and realities more lovely and glorious than it hath entered into the heart of man to conceive, shall satisfy thy soul. Soon after ten o'clock that night a loud firing commenced and was sustained in the direction of the Victoria redoubt opposite the Malakoff tower. Taking advantage of the darkness of the night; a Russian force of 15,000 men issued from Sebastopol. Preserving a sullen silence they approached from the Mamelon under cover of the fire of their ambuscades, and effected an entrance into French advanced parallel, before an alarm could be given to the sentries. After a short but desperate struggle, the French were obliged to fall back on their reserve. The column of the enemy then marched along the parallel, and came up the ravine on the right of the British lines for the purpose of taking them in the flank and rear. On their approach being observed they were supposed to be the French, as the ravine separated the allied armies. Hedley Vicars was the first to discern that they were Russians. he leaped that parapet he had so nobly defended, and charged the enemy down the ravine. One moment a struggling moonbeam fell upon his flashing sword, and he waved it through the air with the last cheer for his men, "This way 97th." The next moment the strong arm which bad been uplifted hung powerless by his side and he fell amidst his enemies. But friends followed fast, his men fought their way through the ranks of the Russians to defend the parting life of the leader they loved. In their arms they bore him back, amidst shouts of a victory so dearly bought. Captain Browne found a stretcher, and placing his friend upon it, cooled his fevered lips with a draught of water. To each inquiry Hedley Vicars answered cheerfully, that he believed his wound was slight, but a main artery had been severed, his life blood flowed fast. A few paces onward, and he faintly said, "Cover my face! cover my face!" What need for covering under the shade of that dark night? Was it not a sudden consciouness that he was entering into the presence of that holy God before whom the cherubim veil their faces? As the soldier laid him down at the door of his tent, he fell asleep in Jesus, to awake in His likeness and be satisfied with it. We asked life of Thee, and Thou gavest it him, even length of days forever and ever." Camp before Sebastopol, March 24, 1855.
of the Sap, which the French were carrying on towards the Mamelon, fell with too heavy masses on their new parallel, to the rear of which they succeeded in penetrating and momentarily possessing, after a gallant resistance on the part of our allies. Having broken through, they passed along the parallel and in rear of it, until they came in contact with troops stationed in our advanced parallel, extending in the ravine from the right of our advance, where it connects with the French trenches. The enemy was here met by detachments of the 77th and 97th regiments, forming part of the guard of the trenches, who, although thus suddenly taken both in flank and rear, behaved with the utmost gallantry and coolness. The detachment of the 97th, which was on the extreme right, and which consequently first came in contact with the enemy, repulsed the attack at the point of the bayonet. They were led by Captain Vicars, who unfortunately lost his life on the occasion, and I am assured that nothing could be more distinguished than the gallantry and good example which he set to the men under his command." 'My Lord: It is with the deepest sorrow that I write to announce the death of Capt. Vicars of the 97th regiment. He was killed last night in the trenches, while gallantly cheering on his men to the attack of a body of the enemy, who taking advantage of the darkness of the night, got close into our trenches. From what I can hear of the affair, he rushed bravely in the midst of them, knocked down two, and was in the act of striking a third, when one of them shot him through the right arm, high up close to the shoulder-- the ball divided the principal artery, and he must soon have bled to death, therefore it is a melancholy pleasure to learn that his sufferings were short. I can not express my own sorrow and that of the regiment at the loss of so valuable an officer, further than to say as it regards myself, I feel that I have lost a brother. It was in his society I felt the happiest. As it regards the regiment he can not be replaced. Contemplating his melancholy loss in the light of a Christian, we indeed ought not to sorrow as those who have no hope, for I feel sure, no officer in the whole army was more prepared to meet his Saviour. I write to your Lordship, as he told one of the officers his mother was with you, and gave direction, in case (as he said) of anything happening to him. The following letter from his beloved friend, Douglas Macgregor, closes our extracts from the "Life of Hedley Vicars." Camp before Sebastopol, March 23, 1855.
put an end to! I had fondly hoped that he would live to go home, and that I might bring my dear friend to you and proudly show him as a specimen of what a model soldier should be. But God's ways are not our ways. He spared him from the horrible death of suffocation by charcoal, for a few months, that he might die a soldier's death. "Noble fellow! he rushed in front of his men, and his powerful arm made more than one Russian fall before that cruel bullet brought him down. It must have been fired close to him, for his coat was singed. When I heard at daylight this morning that Vicars has been brought home dead, you may imagine my grief. I loved that man as dearly as a brother and it seems that I almost hear his voice sounding in my ears as he read, two days ago, the service when some of us met on the day of humiliation. There was a little locket he always wore around his neck, and I remember when he heard we were to come here, he said, 'We should all be prepared to give directions what we wish done in case we get killed; for instance, I have got a little book of Psalms and a locket, which I would wish sent home in case I die." Poor fellow! I remember this, and as I took the locket (a small gold one which opens like a watch) and has a small picture sprinkled with his life blood, I cried so that I thought I would get ill.
"Oh his poor mother and sisters that he loved so dearly!-- But she is a Christian, and has lived to see her once wild and reckless son come to the fold of Jesus, and prove his sincerity by a long and consistent course. I also cut a lock of his fine curly hair this morning, as I know his mother would like to get it. If I were to try to write all the good that my beloved friend did, I should not have room. How he fearlessly visited and spoke to the men in the worst times of cholera, but as he told me he got his reward, for the soldier's dying lips besought blessings on his head. Oh; how happy he is now! Such a death and such a glory now! Even in death, his habitual happy smile did not forsake him. The Lord knew when and how to take him; but it is a severe and unspeakably painful trial to me. so long as the leader of every mad riot, when, after watching him closely for years, and, finding that once enlisted in Christ's army, he never flinched, at last gave in, and acknowledged that Vicars at any rate was a true Christian. "Farewell, Vicars, my loved companion! I knew when he went into action he would show that a Christian soldier was a brave as well as a happy man. I do not exactly know how it all was; I only vouch for the above facts, and the terrible reality of poor Vicars' noble frame lying in the hospital tent, where I saw it. God bless you, dear mother, and may He sanctify this severe trial to my soul. Six months more, and Douglas Macgregor and Hedley Vicars had met again--"Lovely and pleasant in their lives, in their death they were not long divided." Bright as the young survivor's Christian life had been before, it cleared into yet fuller lustre during those short six months ere his sun went down at noon. He regularly visted the hospitals to read and pray, with the sick and dying, and in everything sought to follow in the steps of his beloved friend. "The trumpet shall sound, and the dead shall be raised." These brief extracts from the life of this noble Christian Soldier, are concluded-- with the humble, earnest prayer, that every soldier of our Confederate army may follow Hedley Vicars, as he followed Jesus, the great Captain or our Salvation.